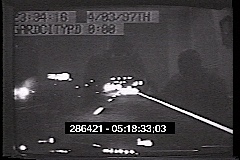 THIS RAINY NIGHT PATROL TURNS INTO A LONG CHASE DOWN THE EXPRESSWAY, A MOTORCYCLIST EVADES BEING PULLED OVER, THE CHASE ENDS WITH THE SUSPECT RUNNING ON FOOT, BUT NOT VERY FAR. DRIVER GETS BUSTED FOR DRIVING 79 MPH IN A 55 MPH ZONE. HE SEEMS A LITTLE TOO HAPPY TO RECEIVE THE TICKET FROM THE POLICE OFFICER. MAN WAS TEST DRIVING THE VEHICLE. SUSPECT ON THE RUN WITH OUTSTANDING WARRANTS TRIES TO RUN AWAY FROM POLICE OFFICER. BUT WITH THE HELP OF A POLICE CAR, THE COPS WASTE NO TIME RUNNING THE BAD GUY DOWN....LITERALLY. A REALLY GOOD CHASE AND WRECK IN THE END. NOTE: THIS DASHCAM IS SHOT FROM A TELEVISION MONITOR AND THERE IS A SLIGHT REFLECTION IN THE VIDEO.